Arsenal tube station is a London Underground station in Highbury, north London. The station is on the Piccadilly line. It is in Travelcard Zone 2. It is between Holloway Road and Finsbury Park tube stations. 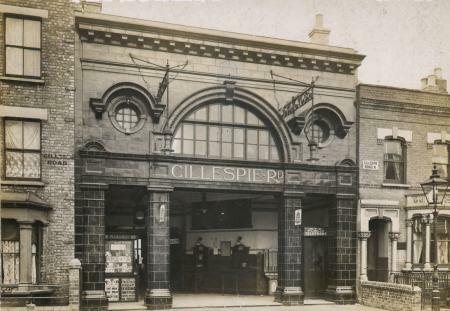 The station was originally known as Gillespie Road. In 1932, it was renamed after Arsenal Football Club. It is the only Tube station named directly after a football club. The station is quieter than other stations on the Piccadilly line except when Arsenal are playing football matches. Gillespie Road station was opened by the Great Northern, Piccadilly and Brompton Railway (GNP&BR) on 15 December 1906. When the different London Underground companies were joined together, the GNP&BR became the Piccadilly line. The original station building and ticket hall were designed by Leslie Green. The buildings had red terracotta on the outside. The station is similar to Holloway Road and Caledonian Road stations, also on the Piccadilly line. 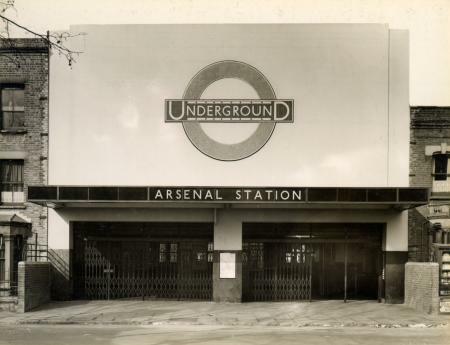 The station was renamed to Arsenal in 1932. ↑ 2.0 2.1 Croome, Desmond F. (1998). The Piccadilly Line. Harrow Weald: Capital Transport. ISBN 1-85414-192-9. Wikimedia Commons has media related to Arsenal tube station. Rebuilt station building in 1934.